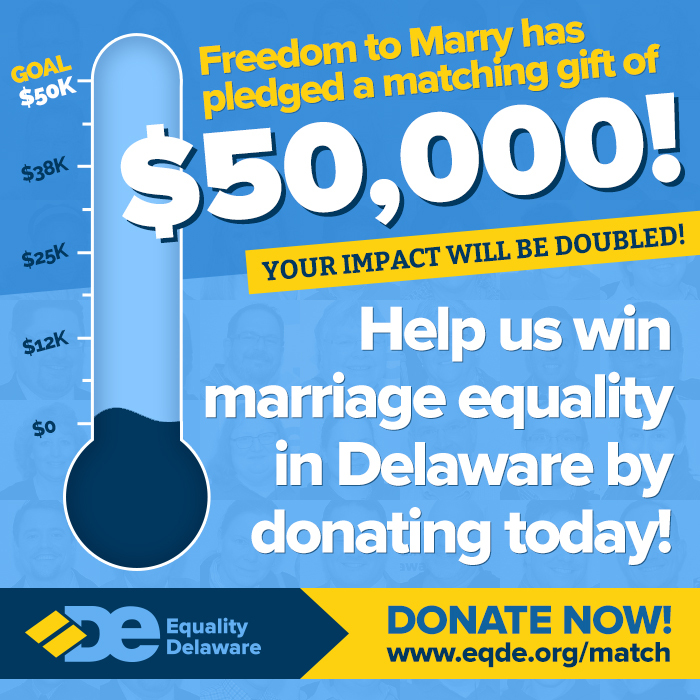 Freedom to Marry, one of our leading national partners, has just pledged to match every dollar we can raise over the next month -- up to $50,000! That's $100,000 that would propel this campaign forward in a big way. With this critical investment, we can build one of the largest grassroots campaigns Delaware has ever seen -- and win the support of key legislators. We can be the next state to capitalize on national momentum for marriage equality. Our campaign is strong, but your support will make us even stronger. Can you make a contribution to our work right now? Who's donating: Esteban Lee-O'Neal from Lafayette, CO donated. Thank you! You will not receive any emails from them, they just deliver your donation to us. Like this & Encourage your friends to donate!